Eezycut Trilobite Line Cutters are one of the most efficient and effective cutting tools on the market for scuba diving, seat belts, sky diving and many other applications when you need something cut fast! Choose Your Colour: Yellow, Black, Pink, Orange, Red or Glow in the Dark. Priced in Canadian Dollars. Open faced diving knives are notoriously dangerous, especially on rocking boats and in dark caves. Also, their large size means they are located in difficult to reach places, unsuitable for a response to an emergency situation. The small size of the EEZYCUT® Trilobite means it can be conveniently located on any area of a divers configuration. The EEZYCUT Trilobite is available in two types of pouch. 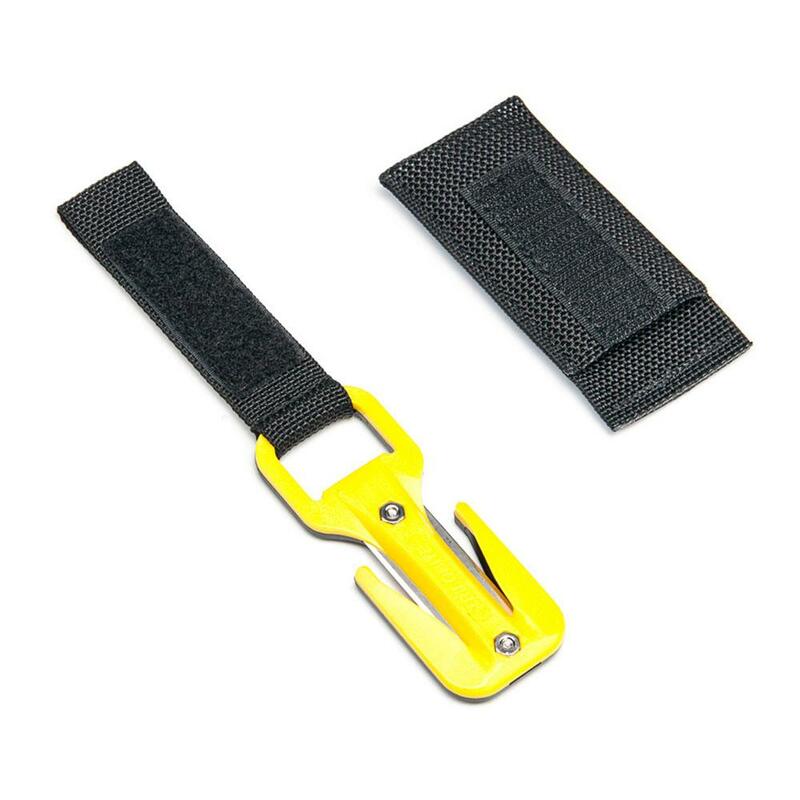 A harness pouch fits neatly onto any two inch scuba webbing. The EEZYCUT Trilobite is also available in a wrist pouch, which fits most dive computers with a 1 1/4 inch width strap, with ease. The design ensures that this has a snug, movement free fit against the wrist, where it provides the maximum amount of accessibility, and therefore the quickest response. Beyond that, for divers who are working in the water, locating the knife on the wrist means that the diver has to conduct only the minimal amount of movement necessary when using the cutting device. This makes it easier to maintain ideal trim and buoyancy in the water column. This in turn gives the diver the ability to maintain their awareness of the environment around them, making it a practical and safer option for working divers. (The thick width of the Galileo dive computers means that they can be worn on the wrist using the harness pouch). The ergonomically patented design uses a longer section of the cutting edge, prolonging the integrity of the blade by dispersing the erosion. As the line is pushed onto the blade by the frame of the tool, the cut is much more stable, which not only provides a much cleaner splice, but helps the blade retain it’s edge. Other “closed” cutting tools have one pivotal stress point on the cutting surface which quickly corrodes and weakens. Incredibly effortless cut – The “WOW” factor! Normal “marine grade” stainless steel, in terms of diving knives, is generally the name given to 420 grade stainless steel, also known as a cutlery grade. Whilst it has a good corrosion capacity in water, it does not have such a good capacity to hold a sharp edge. Titanium can not create as sharp an edge as stainless steel. The grade of stainless steel used in the EEZYCUT Trilobite (440a) is known for it’s capacity to hold an extremely sharp edge, whilst having very good corrosive qualities. When the blade loses its edge or starts to corrode, you can put a new blade in, and yet again have the sharpest, cleanest cut in the water. Washing in fresh water after diving is recommended for all stainless steel knives and blades. All stainless steel which is used in salt water, including open faced dive knives, need to be treated with care. Carefully coating any stainless steel blade in normal divers silicone grease prior to salt water usage significantly prolongs the life of the blade, and is recommended for the EEZYCUT Trilobite blades. Get a FREE Set of Replacement Blades with purchase. The small, convenient size (93 mm x 36 mm x 8 mm / 3.66 inches x 1.42 inches x 0.32 inches) make it ideal to use as part of a divers options for redundancy. Divers should carry back-up’s of all life support equipment, including the cutting tool, and the EEZYCUT Trilobite can fit easily into that inventory. This means that the diver does not have to ditch their open faced knife should they wish to keep it as part of their diving equipment. It fits anywhere, In the pocket, on the harness, or even on the wrist for effortless access. The high strength polycarbonate plastic of the EEZYCUT Trilobite is rated to cut line up to 8 mm thick, with ease, every time. The EEZYCUT Trilobite also cuts all types of webbing with ease. The Trilobite can be mounted on a harness waist strap, shoulder strap or on the wrist strap of most dive computers.